Hello everyone! It’s Monday again! Yay! I, for one, love Mondays! One of the reasons why is Katie’s marvelous in my mondays blog hop party 🙂 Make sure you guys check out other bloggers posts on how they make their Mondays marrrrvvvelous! 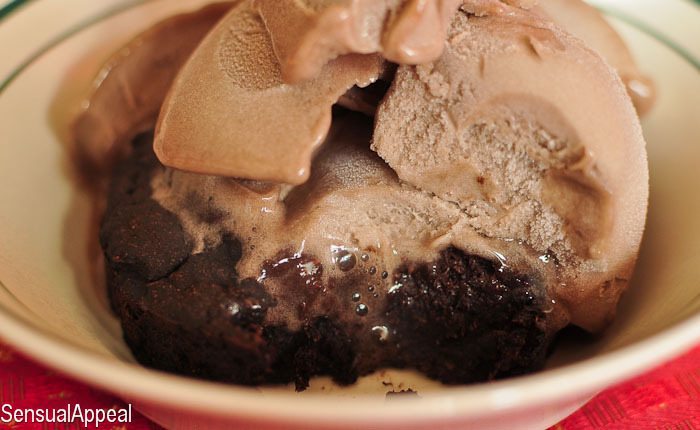 Hershey’s Special Dark Cocoa Powder – Consider me obsessed. This cocoa powder is the best I have ever tried. I can’t get enough. It’s so deep and dark it’s marvelous how much flavor it provides in just one tablespoon. I simply adore it! I have been on a craze with using it in almost everything from protein shakes to yogurt to baked goods. Coconut flour – I finally started using coconut flour that I purchased a few months ago and again, I freaking love it. Its flavor is marvelous and it really makes a simple food taste like a treat. Stay posted for more recipes using it. A recent recipe I made using coconut flour and Special Dark cocoa powder is the single serve coconut brownie recipe. Arctic Zero ice cream – I love using the Arctic Zero ice cream with various toppings or topped on the brownie as shown above. It’s such a perfect dessert for a hot summer day, especially since I don’t have to feel guilty about eating it. By the way, my Arctic Zero giveaway is open until next week so keep the entries coming! I know you want to win that marvelous prize pack of 8 ice cream pints + 8 bars! PS. Why are all of the Fifty Shades pics with Robert Pattinson and Kristen Stewart? Umm, no, he is NOT even attractive. No way would he play a good Christian Grey. Not a chance. Lastly, I started doing the #plankaday challenge and I want to get up to 2 minutes by the end of the month. I have gotten up to one minute and 45 seconds so far. Woop! 🙂 Progressing is such a marvelous feeling. I measure my planks separately from my workouts cause I find I last longer this way. I have to admit that, though it comes with strong recommendations, I’m a little nervous to read 50 Shades of Gray! If you’re open minded enough, to crazy sexual things, you’ll love it! Well this is all great stuff! I’ve been on a massive cocoa kick lately too. I just started #plankaday yesterday! I want to work up to 5 mins! I hate how Robert Patterson is in all the 50 Shades stuff. He’s not only a terrible actor but terribly unattractive. uck. Coconut flour rocks, glad you are liking it! I love coconut flour too! I’m going to have to try that chocolate coconut brownie! Chocolate and coconut are two of my favorite things! True Blood is so good! I’ve never read it, but RobbyPatz is in the 50 Shades stuff because it was originally a Twilight fanfic that was turned into a book. Mystery solved, lolz! 😛 I hope you had a great day!